With Affinity Credit Cards from Bank of Ireland, you not only get all the advantages of a great credit card, Bank of Ireland also makes a donation to the college you choose and will donate a percentage of your annual expenditure at no expense to you. Affinity Programmes available are: Trinity College Dublin, University College Dublin, University College Cork, University of Limerick, NUI Galway, NUI Maynooth. 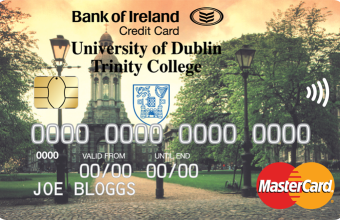 Supporting your College – We make a donation when you become an affinity cardholder, as well as donating an additional payment to your University’s alumni fund for each year your Affinity card is active. You also receive your college branded credit card. Emergency Cash Service – Should you lose your card while abroad, we’ll cancel your card. If you are abroad we can provide you with an Emergency Cash Advance Facility in most countries (Subject to available credit, fees and charges may apply). It only takes a couple of minutes to apply online. 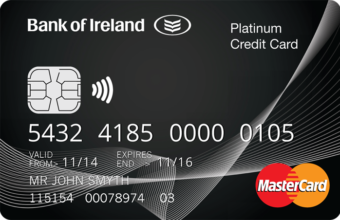 1 Available if you don’t currently hold a credit card with Bank of Ireland, whether you have an account with us or not. At the end of the introductory period the annual interest rates revert back to the standard rate applicable to your card at that time.